A new Responsive template-based theme system designed to get you looking good and selling quickly on any device. 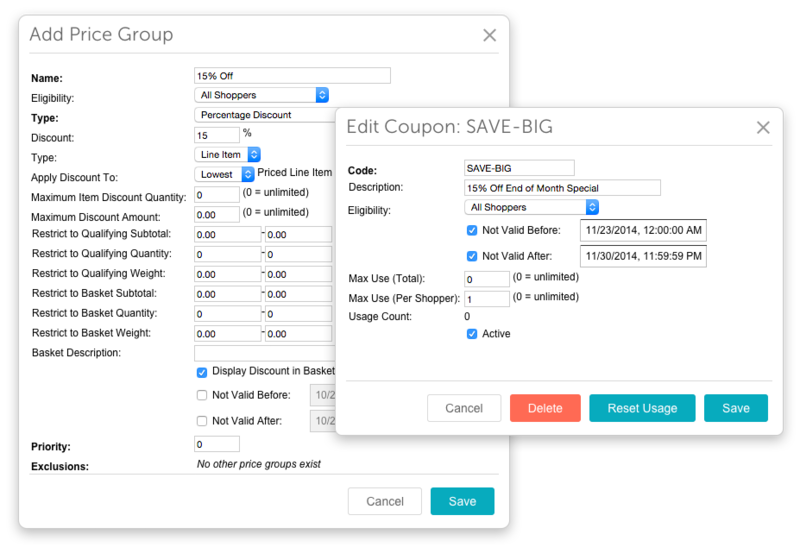 New discounting & marketing engine includes coupons, volume pricing, free shipping & more. Miva Merchant's unique CMS saves you time and effort when it comes to managing your site. Use our Bootstrap 3 template to easily develop fully responsive stores. Hire a Miva Certified Developer to assist you in your site build. Did you know that the biggest reason people abandon shopping carts is shipping costs? That's why Miva Merchant contains a mini-basket with a shipping calculator on every page. A shopper's experience is crucial, and your store has to be more than just a pretty face. Miva Merchant has it all, including special Business-to-Business features out of the box. With a fully customizable checkout flow, Miva Merchant provides the tools necessary to maximize your conversions and squeeze more revenue out of existing traffic. Often the single most important thing an ecommerce store owner can do is to improve the performance of their current website traffic. Do you have specific customer or account needs? Many problems can be solved by adding custom additional fields to the checkout and product pages. 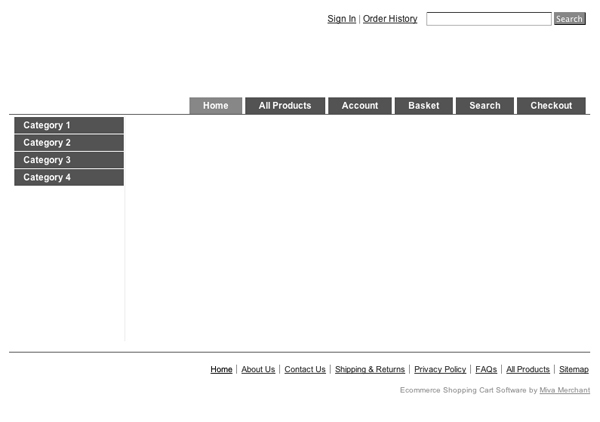 Checkout is what makes ecommerce sites more complicated than normal websites. We take the pain out of checkout for you and your customers. Checkout flow can be completely optimized for any unique business needs, including One Page Checkouts, 2 Step Checkouts or more traditional 3 and 4 Page Checkouts. No two businesses are alike, and their checkout processes shouldn't have to be either. It's not just about getting a store live; it's about running a business. Miva becomes the "brain center" for all your vital departments. Miva provides JSON API and XML feeds, too. The more you grow, the more you will want to automate. Miva Merchant is ready to "talk" to the most popular SMB and Enterprise-level systems. Connect your ERP, Accounting, CRM, Fulfillment Center or more to Miva Merchant and streamline your operations. Maximize sales by getting in front of more shoppers without the hassle of running multiple stores. Miva allows you to manage your marketplace listings from one centralized location, allowing for accurate inventory, order processing and customer service. In this day and age it's vital for ecommerce store owners to get their products seen by potential customers. One of the best ways to do that is to list your product catalog in popular online marketplaces like eBay and Amazon (coming soon). Miva Merchant makes that simple to do, all while managing your inventory and orders from one centralized admin. Search Engine Optimization is easy to do with Miva Merchant. We give you complete control over how your content is presented to Search Engines. Your store gets built from the ground up to be search-engine friendly. Avoid post-order management headaches due to inventory problems. Hide out-of-stock products or allow special "backorder" orders. Inventory can be manually updated per product via the GUI, in batch via a high-speed CSV import or automatically via CSV, XML or EDI. Miva Merchant offers industry-best inventory tracking of a product, including products with variations / attributes like size and color, etc. Unlimited depth of product options and / or kit-building allows for the power to manage very complex inventory sets and never worry about unexpected back orders or customer dissatisfaction. Track inventory on products or any product variation combination like size, color, etc. Miva Merchant takes the pain out of running your online business and makes phone orders, customer service and returns a breeze. Our role-based multi-user administrative interface allows you to create access groups based on the need of the person logging in. Allow one or more administrators access to all or part of the admin system, giving them enough access to do their jobs while keeping security tight. Our easy-to-use browser-based interface makes it dead simple to add and edit products and categories and run reports on your business, as well as manage orders (including taking phone orders) and shipping and fulfillment. No limitations and a product setup to match your business. Store your product SKUs or other information along with a product, either visibly or invisibly to help back-end processing. Product import / export for easy setup and maintenance. Separate product codes and SKUs for more flexibility in how you configure your data. Organize unlimited products in unlimited categories and subcategories. Each product can have unlimited variations (e.g., size, color, etc. ), each of which can be assigned specific photos and inventory levels. Harness the power of Google Analytics. One-click Google Analytics integration allows tracking and A/B testing in a snap. Knowledge is power. Miva Merchant helps you understand web traffic patterns and sources as well as customer shopping habits. If Miva Merchant doesn't do something out of the box, there is an entire development language behind the scenes that can be used for robust modification. Anything is possible. We strive to include all the features you might ever need in Miva Merchant, but every business is different. Because of this, Miva Merchant supports ways for developers to make deep changes to the way the store works.